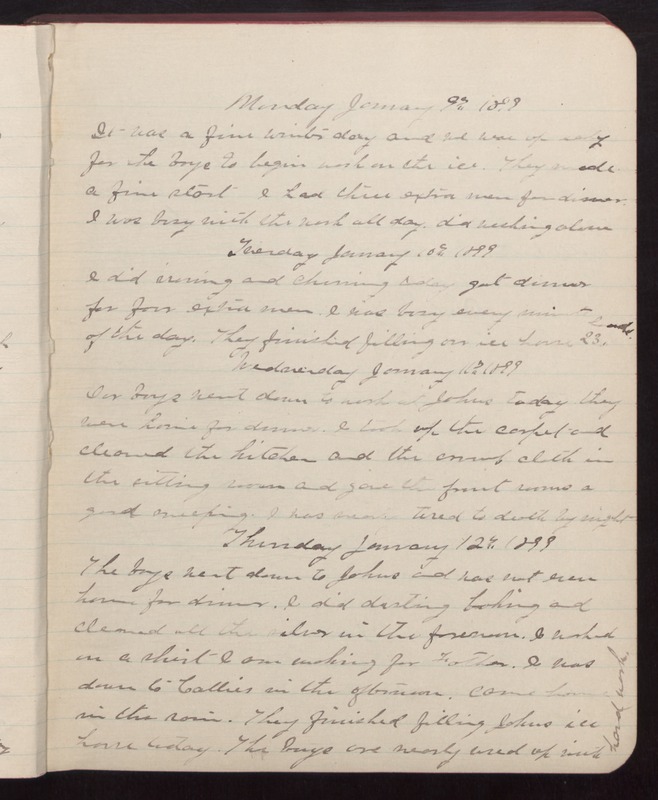 Monday January 9th 1899 It was a fine winter day and we were up early for the boys to begin work on the ice. They made a fine start I had three extra men for dinner. I was busy with the work all day. did washing alone Tuesday January 10th 1899 I did ironing and churning today got dinner for four extra men. I was busy every minute of the day. They finished filling our ice house 23 [loads?]. Wednesday January 11th 1899 Our boys went down to work at Johns today they were home for dinner. I took up the carpet and cleaned the kitchen and the crumb cloth in the sitting room and gave the front rooms a good sweeping. I was nearly tired to death by night Thursday January 12th 1899 The boys went down to Johns and was not even home for dinner. I did dusting baking and cleaned all the silver in the forenoon. I worked on a shirt I am making for Father. I was down to Callies in the afternoon. Came home in the rain. They finished filling Johns ice house today. The boys are nearly used up with hard work.